There’s been something I’ve been wanting to write about but haven’t been able to write about because, well, I couldn’t. Some things are ready for sharing as they happen. Some things will never be ready for sharing after they happen. Some things need time to process before they are shared. Maybe most things need time to process before they are shared? Some things after they are processed move from being a sacred burden to becoming a sacred testimony to community, love, and grace. I feel safe today, not ashamed, and want to share because there may be someone else out there who hasn’t shared yet and needs to hear this. I want to talk about this journey and struggle more, I’m just figuring out how and when and even where to begin. I want to tell others about it because I think it helps to see humanity win. But I want to focus on just one part of it today, the part where I desperately needed grace. I know what it feels like to need grace and need someone to pause and sit with me in the dark–the place where I’m pretty sure hope is born. Hope is the brightest thing I have ever seen in contrast to the darkness that has at times settled around me. I needed someone to help me hold onto that hope. I needed someone to help me with a personal comeback that seemed out of my reach. I needed someone to say it’s okay if you’re not okay, it’s okay if you’re not awesome, it’s okay if your not doing your best right now, it’s okay. And I feel like this is our role in youth ministry. To cultivate conversations and relationships where teenagers can walk in post “Friday” with the heaviest of burdens, heartbreaks, mess ups, and failures and say “I’m really not okay” while feeling at the same time that their not okay-ness doesn’t make the space or time any less valuable. They need someone to say to them “you are valuable regardless what’s happening in your world.” To feel safe somewhere, to feel cared for, to feel seen, heard, and loved…regardless…it’s what grace giving youth ministries look like. It’s what friendships look like. It’s what families look like. I think that’s what love looks like. 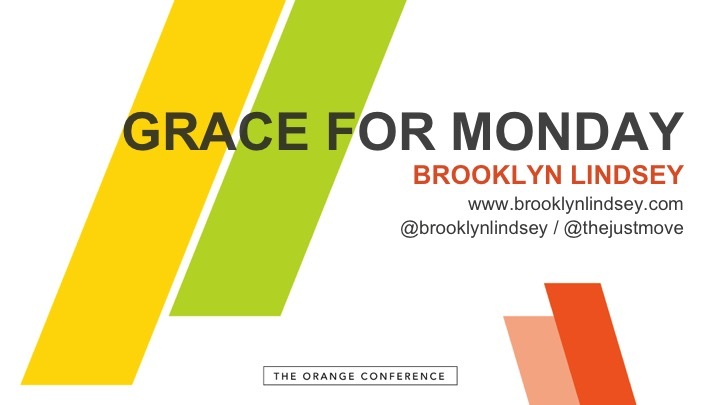 I’m excited to get to share a breakout “Giving grace to teenagers on Monday’s…or Friday’s” at Orange Conference today. I feel like it could make the difference in some kids Monday (or Friday or whatever day we have the privilege of sitting with them in their darkness). We’re going to be touching on a lot of things that help culture and conversations become a wider opening for grace to come in, specifically as it relates to the need for grace in the phase of adolescence. Here are the notes and presentation files if you’d like to have them.